The game has two religions that offer the basic teleportation service: kamis and karavan. There are also two organizations (marauders and rangers) that have special ways of teleporting, about which you need not be concerned when starting out. As you progress more, you will learn about these organizations and decide whether you like their system better. This topic will only cover kami+kara. Each region, including the Prime Roots, will have both a kami and a karavan altar. Once you buy a tp at a particular altar, you can use the pact at any time to return to the region; of course, the act of teleporting uses up the pact and you must rebuy one on arrival. Your alignment dictates which pacts you are able to buy, and where. As a reminder, a player comes neutral from Silan, and must do a specific rite in order to align with a faction. Some pacts are neutral, some are faction-only. 0.a. You invoke a pact from your inventory. 0.b. Teleportation is channeled for 15 seconds before your body disappears from the starting location. If you take significant damage, channeling is interrupted. If you are killed during the channeling phase, tp'ing is canceled and you are sent into coma, pending either respawn or a healer. The pact is not used up. If you are under duress and wish to teleport, you could use MPA (melee protection aura) to give yourself the required 15 seconds. Since you are not taking damage under MPA, teleportation happens. 0.c. If you are in a coma, you are allowed to use teleport pacts, and their usage will be instant. Of course, this uses up a pact and you must re-buy it. 1.a. All capital regions will have two neutral altars (both kami and karavan). One will be less convenient to use. If the nation is traditionally kami, then the karavan altar is outside city gates (Zora, Pyr). If the nation is traditionally karavan, then the kami altar is outside city gates (Fairhaven, Yrkanis). 1.b. Non-capital cities will have only one altar, according to the traditional religion. Tryker and matis cities have a karavan altar, and zorai cities have a kami altar. The Fyros are exempt since their non-capital cities are not in the capital region; instead, rule #2 applies to Dyron and Thesos. - Nexus (bordering other prime roots regions). 4. Level 250 continental regions have no neutral pacts either. You must align with kami or karavan and raise your fame to 33 before you can buy any pact in those regions. Simply raising your fame is not sufficient, you must also do the rite. Note that Flaming Forest is not a region of its own, but a part of Scorched Corridor. It has no altars, and there is only one ramp connecting FF and SC. However, the Oflovak Oasis kami and karavan altars are very close to Flaming Forest, most players will be using those to enter the place. 5. All other regions not covered above will have either kami or karavan as neutral. 6. Changing your faction affects the rules! Once you reach fame 30, you are able to do the rite and align with kami or karavan. Once aligned, you can only buy pacts of your new religion. If your fame is 30 and you do the rite to become kami, you lose 4 kara capital pacts + 9 border-region kara pacts; additionally, you must replace pacts with the opposite faction. For instance, you must replace your Maiden Grove karavan pact with a kami one (idem for Upper Bog, etc). And since your new alignment forbids you from using the Maiden Grove karavan pact, you must travel on foot to get the kami one. Also at fame 30, right after the kami rite, you gain access to the zorai city pacts (Min-Cho, Jen-Lai, Hoi-Cho). Once you raise your fame to 33, you gain access to 4 kami pacts in each of the q250 regions. Once you raise your fame to 60, you gain access to 9 kami pacts in prime roots regions). 7. The q250 / PR rules (4 & 5) trump the border rule (2). As such, there is no neutral pact in Lagoona of Loria, despite the fact that it borders lakes and forest continents. The same goes for Void, Scorched Corridor and the various PR regions. 8.b. The non-capital cities are still in a q50 region, and cost 1000 dappers too. Although Dyron and Thesos are in q200 regions, their pacts seem to follow this idea, so they're 1000 dappers. 8.c. Nexus is counted as a PR region and pacts cost 10000 dappers; they also have the same black background like PR ones. This is most probably a relic of the times when supreme materials were appearing in Nexus. 8.d. A world tour can easily set back a player by at least 50.000 dappers, especially if they buy 2-3 pacts everywhere. You can use respawn points when you are in a coma, either when the timer expires or if you choose to do it earlier. Your religious fame will affect your availale respawn points, but far less than it affects teleportation. 1. There is a respawn point in every capital, activated as soon as you enter the capital the first time. You can respawn either at the kami or the karavan altar, depending on which fame is higher. By default, matis and tryker characters have positive karavan fame (and negative kami), whereas zorai and fyros characters have positive kami fame (and negative kara). 2. There is a respawn point in every city, activated as soon as you enter the city for the first time. These points are only available if your fame agrees with the nation tradition. Fyros and Zorais are traditionally kami, and as such characters with the kami fame higher have a respawn point in the cities of Dyron, Thesos, Min-Cho, Hoi-Cho and Jen-Lai. Matis and Trykers are traditionally karavan, and as such you need karavan fame to be higher if you want to respawn in Crystabel, Windermeer, Avendale, Natae, Davae or Avalae. Note: do remember rule 0.c when you're in a coma in the desert. 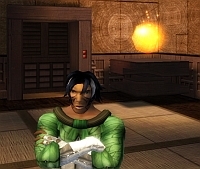 A neutral character with karavan fame higher can still invoke the kami pact for Dyron or Thesos and respawn inside the city despite lacking the respawn point. Of course the pact is used up and must be rebought. 3. There is a respawn point at continent borders, for a total of 19. They are exactly at the vortex that allows you to cross from one continent to another. Simply approaching the vortex will add the respawn on your map. It is however recommended to go through the vortex, considering that each has a pair vortex (and respawn) on the other side, that you also want activated. For homins who don't want to join Kara or Kami, there are two other options to fast travel later on (above melee 100 or something). I feel it important to point out that a few of the portals listed are not on the edge of a region and thus may not seem like they are a border but they actually are. The portals to/from Prime Roots may appear in the middle of the Jungle or Desert, but they are still the border between PR and wherever. "Border" doesn't always mean "edge".